Gaming systems and small form-factor (SFF) PCs have emerged as bright spots in the desktop PC market that has been subject to severe challenges recently. Many vendors have tried to combine the two, but space constraints and power concerns have ended up limiting the gaming performance of such systems. Zotac, in particular, has been very active in this space with their E-series SFF PCs. Earlier this year, Zotac's engineers came up with an innovative chassis and thermal design to cram a desktop class processor and a high-end discrete desktop GPU into a SFF chassis. The system still retained the limited configurability that consumers have come to expect from such systems. Despite being innovative and unique, the motherboard features of the first generation product - the ZBOX MAGNUS EN980 - betrayed the time spent by Zotac in perfecting the other parts of the system design. However, after getting the product out, Zotac has been quick to iterate. The second-generation product - the ZBOX MAGNUS EN1080 that we are reviewing today - apparently fixes many of the shortcomings pointed out in our earlier review. The specifications of the EN1080 indicate that it can take advantage of all the modern features of the Skylake platform. There is a CPU upgrade from the 65W Core i5-6400 to the Core i7-6700. More importantly, we move from the Maxwell-based GTX 980 to the Pascal-based GTX 1080. On paper, this has resulted in a premium Skylake PC that can handle the latest and greatest workloads thrown at it. It is fitting that the release of this compact, yet, ultra-powerful rig coincides with Zotac's 10-year anniversary. In this review, we will take a look at the performance of the system and also determine the areas where Zotac can improve in the upcoming products in this lineup. 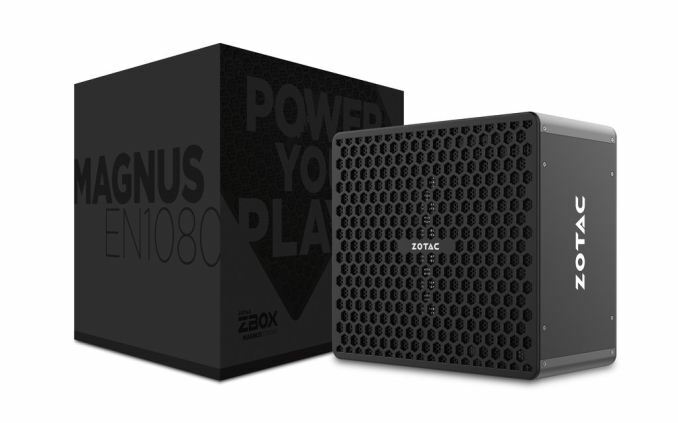 Zotac's ZBOX MAGNUS EN1080 makes its appearance in the market within a few months of its predecessor, the ZBOX MAGNUS EN980. The claims for both systems are essentially the same - a powerful VR-ready gaming mini-PC that is equipped with a high-end desktop CPU and GPU. In terms of physical footprint, the EN980 and EN1080 are the same (5.85L / 225 mm x 203 mm x 128 mm ). Putting a high-end desktop CPU and GPU in that form factor with a liquid cooling system is technically impressive, and we have given the chassis and cooling system enough praise in the ZBOX MAGNUS EN980 review. The EN1080 retains the industrial design of the EN980. In fact, the only difference in the external appearance of the chassis is the addition of a HDMI port in the front panel. Internally, there is a bit of fancy LED lighting (controllable via the Spectra utility) that can spruce up the power button and the logos on the top and sides of the chassis. In addition to the main unit, the PC package also includes two 180W (19.5V @ 9.23A) power bricks along with US power cords and two WLAN antennae. A quick start guide with installation instructions for the memory and disk drives, a user manual and a read-only USB key with the drivers round up the rest of the package, as shown in the gallery below. There are a few miscellaneous items (such as a 'do not disturb' door-tag with the Zotac logo) promoting Zotac's 10-year anniversary. We received the barebones version of the ZBOX MAGNUS EN1080. In order to complete the build, we used two 16GB Corsair Vengeance DDR4 SODIMMs and a 512GB Toshiba OCZ RD400 M.2 2280 PCIe 3.0 x4 NVMe SSD. The Corsair SODIMMs can operate at up to 2667 MHz, but, in the EN1080, they are capped at 2133 MHz. The Toshiba OCZ RD400 has no such issues, and operates with the full PCIe 3.0 x4 bandwidth. Note that OCZ's custom NVMe driver is needed to obtain the best performance out of the SSD. Internally, the EN1080 uses the B150 chipset (compared to the H170 used in the EN980). However, given the configurability options (only the DRAM and SSD / HDDs are left to the end user to complete the hardware configuration), the choice of chipset really doesn't matter. Obviously, if Zotac were to go back to the specifications stage and look into more peripherals I/Os based off PCIe bridges, the B150's limited number of high-speed I/O lanes might be problematic. In terms of the audio codec (Realtek ALC892), Wi-Fi (Intel AC3165), LAN controllers (2x Realtek RTL8168), USB 3.1 controller (ASMedia ASM1142), and the SDXC card reader (Realtek-based USB 2.0 bridge), the EN980 and the EN1080 are the same. In the table below, we have an overview of the various systems that we are comparing the Zotac ZBOX MAGNUS EN1080 against. Note that they may not belong to the same market segment. The relevant configuration details of the machines are provided so that readers have an understanding of why some benchmark numbers are skewed for or against the Zotac ZBOX MAGNUS EN1080 when we come to those sections. There was a nice trend of posting size comparison pics with a can of soda and a cig pack. I think those belonged to either Ian or Brandon (the cola can I think).... No one else got em! Cool system but IMO since a GTX 1080 is not quite enough for full blown 4k gaming then why waste all that money getting it. The best buy is the ZOTAC ZBOX MAGNUS EN1070 Gaming Mini PC, Intel Skylake Core i5-6400T which only costs $1200. GTX 1070 is powerful enough to handle anything 2k and below which is all you could really do comfortably with the 1080 version so most of that extra $800 would be going to waste. It isnt enough for 4k, but it is enough for 1440p, or for 1080p for years from now. You could buy this with the knowledge that, at 1080p, say with a g sync monitor, you would not need to replace it for 5+ years. LOL no card can max out 1440 @144hz consistently (you even put it in your own post) so why waste $800 getting a 1080 when a 1070 is enough to get 60+fps in 1440 everywhere and will do any game @1080p (even lesser cards than that are more than enough for 1080)?